The Bible speaks. God’s word transforms. As a Christian involved in pastoral care, I’m sure you’ll agree. And so, like many of us, I imagine you try to bring Scripture in to each encounter you have with someone who is struggling in the face of the brokenness of this fallen world. It’s the bedrock of biblical counselling. It’s a distinctive that many of us hold dear. 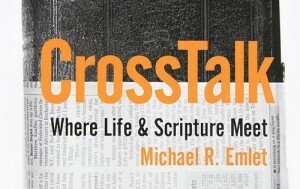 But, as Mike Emlet observes in his book, CrossTalk, there are 2 things with which we often struggle. Firstly, you may have noticed over the years that our “functional Bible” can be quite small. We know that each and every passage of Scripture is true and wonderful and useful but, when it comes down to it, we often head for the same passages: the same parables, the same Psalms, the same snippets of wisdom from Paul’s letters. When was the last time any of us opened up the middle chapters of Revelation with someone in pain? How often do we head to the narratives of Ezra or Joshua when someone is in tears? How naturally could we integrate Malachi into a conversation over coffee? Secondly, the passages we do use don’t always connect well with the person listening. Maybe you know the feeling: you’re sitting in church, a friend tells you about their fears for the future, you ask a few questions and then turn to Matthew 6: “do not worry about tomorrow, for tomorrow will worry about itself”… It’s not a wrong thing to do – in some ways the verse is apt – but it doesn’t seem to help. Your friend nods, says thank you and walks away just as fearful as before. But it doesn’t have to be that way – there is a richness in Scripture that is wide and deep. If you want to know more about it then CrossTalk is a definite “must read”. Emlet’s style is clear and appealing throughout. His love of God and his love of God’s word flow through every page. And he understands people. He really gets how people think and how people best engage with Scripture when they’re hurting. He sees Christians as saints, as sufferers and sinners. That means that at any given moment in time there will be good things in our life for which to praise God, hard things in our life for which to seek God’s justice and comfort, and wrong things in our life for which to ask God’s forgiveness. Having that framework in mind helps us to broaden our biblical horizons. We’re not just looking for a verse that makes a quick connection with someone’s behaviour, we’re looking for passages that speak to each of the 3 aspects of their being. And rather than taking verses out of context, he encourages us as counsellors (formal or informal) to see each passage in its original context (including the pastoral aims of the author) and its larger context (in the history of God’s rescue plan) before applying it. Doing that isn’t as complicated as it sounds! Doing that means we start to see connections between the Bible and 21st century pastoral problems all over the place – indeed in the most unexpected chapters of God’s word. And how exciting that is! How wonderful to see people running to Jesus, changing to be more like Jesus, better equipped to tell others about Jesus because they have truly encountered him in Scripture. But don’t take my word for it: if you have a heart for people and a thirst for Scripture, this book will equip and inspire. Buy a copy online or grab a bargain at the Biblical Counselling UK conference bookstalls this week.